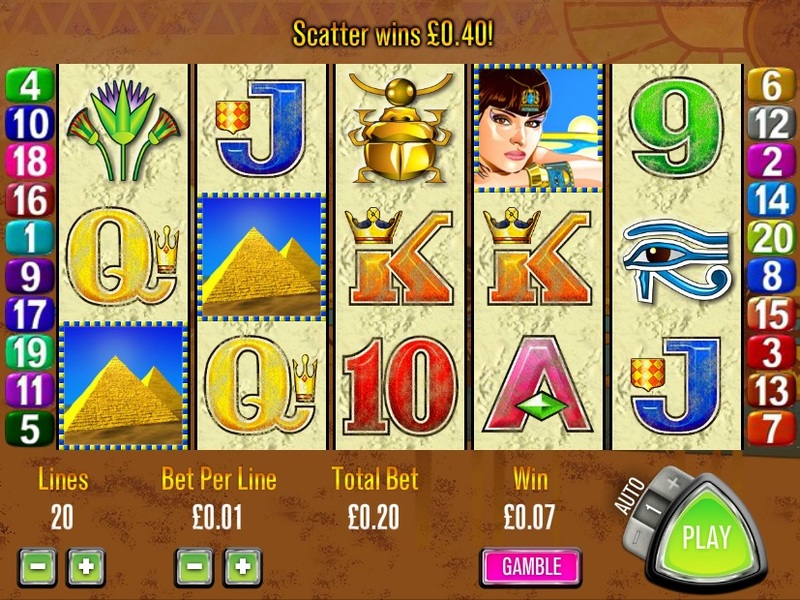 The original version of Queen of the Nile slot was released in brick and mortar casinos by Australia’s leading software developer, Aristocrat in 1997. And after the invention of the internet, it became popular not only for because of the action and fun but for introducing the free spin feature. It has an appealing ancient Egypt theme depicting the time when Pharaohs ruled the land. Additionally, Queen of the Nile has a straightforward gameplay and multiple chances of hitting the jackpot. The good thing is that you can choose to play it on your PC, smartphone or tablet. Queen of the Nile has 5 reels, 20 paylines and a wide variety of coin sizes to choose. All wins pay from left to right but the scatter which pays when it lands anywhere on the reels. Gamblers can choose to play 1X, 5X, 10X, 15X or 20X on each spin. In addition, the number of coins which can be played on a single payline ranges between 1x to 100x maximum. This slot has a coin size of $0.01, meaning the maximum bet ranges from $0.20 to $20. With this, Queen of the Nile is the best slot game for players with any size of bankroll. Except for the scatter wins (pays as multiples of the total bet), other wins pay as multiples of the line bet. The developers have retained the original look of the original brick and mortar slot machine. Nonetheless, with the advanced technology, you will find appealing graphics and great sound effects especially when the scatter symbol appears. You will also hear a jaunty tune and dramatic drum beats after every winning spin. There are stunning ancient Egypt symbols including Pharaoh, Cleopatra, a scarab beetle, the pyramid, and the all-seeing eye. This jackpot slot has a medium variance where players can win fairly despite the small payouts. Unlike in other slots where the pyramid scatters symbol, golden pot, pharaoh, and 9 decker card symbols pay 3x, Queen of the Nile pays 2X. Nevertheless, there are sizeable jackpots on offer for you. The highest jackpot you can win in the base game is $9000 after hitting 5x Wild symbols or $8000 for hitting 5x Scatter symbols when playing with the max bet. All wins are tripled in the 15x free spin feature and the gamble feature allows any jackpot win to be multiplied by 2 or 4x.